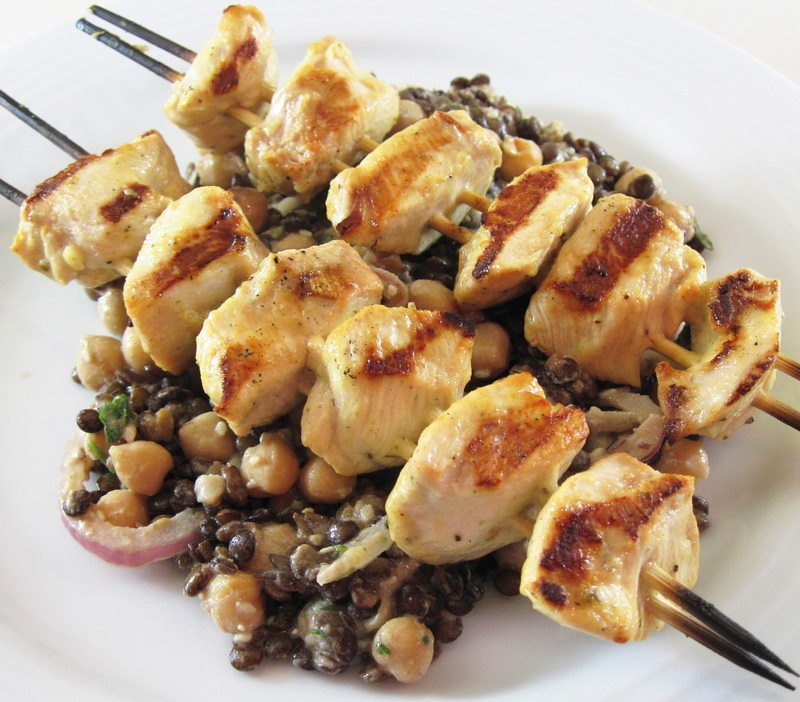 Although the Lentil and Chickpea Salad Carrie made could easily stand alone as a delicious vegetarian entrée, I decided to serve some of the leftover salad with Mustard Grilled Chicken Kebabs. It was a great combination! The Mustard Grilled Chicken Kebabs were super easy. I used a Kalyn’s Kitchen marinade but did not include the rosemary or celery seeds. The marinade was quick to mix; I put it and the cut-up chicken breasts in a Ziploc bag and marinated the chicken for about two hours. Longer would have been better, but it was sufficient to give them a bit of flavor. Using 2 skewers for each kebab makes it easier to handle them on the grill. 1. Whisk together all of the marinade ingredients. 2. Cut the chicken breasts into cubes about 1-inch square. 3. Put the chicken and marinade into a Ziploc bag. Seal and work the bag a bit to distribute the marinade. Refrigerate for at least 2 hours; 6 – 8 hours is even better. 5. Put the chicken on the skewers. Grill for about 4 minutes on one side. Turn and grill for an additional 3 – 4 minutes. The kitchen kebabs look delicious. Thanks for sharing and have a nice weekend!! !